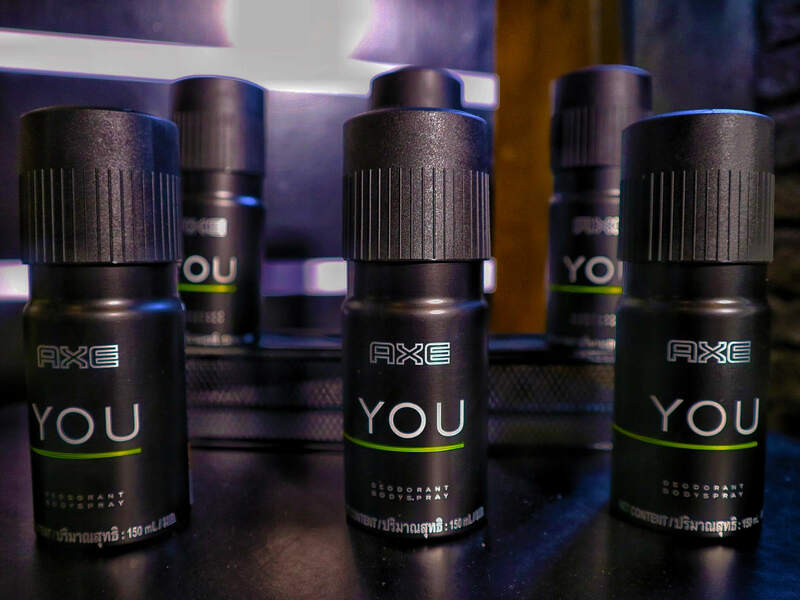 AXE, the world’s Number 1 male fragrance brand is proud to introduce its newest variant – the new AXE YOU. As a brand that encourages men to embrace their own unique style, has crafted a new bold and fiery scent for the young adventurous you. 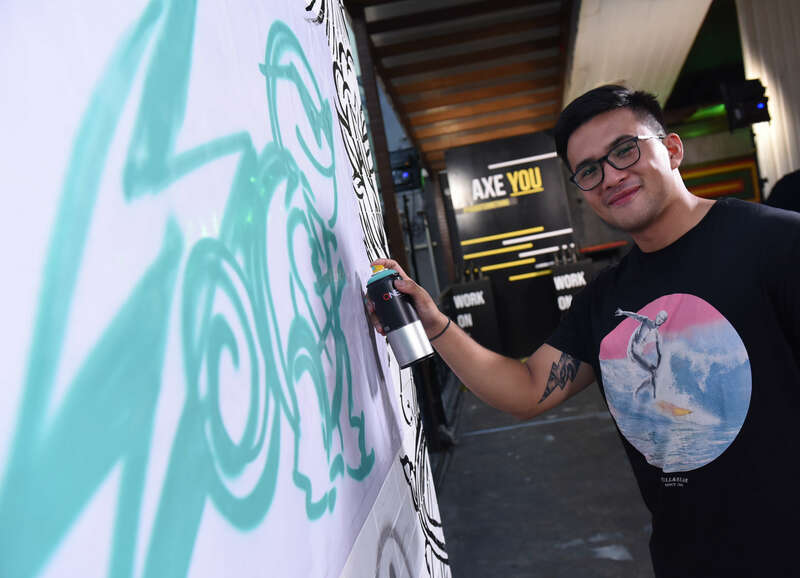 In line with this campaign, comes the unveiling of AXE PROJECT YOU. Essentially a masterclass series, Axe Project You seeks to ignite men’s passion within, inspire creativity, and push things further by honing their talents and skills. And Axe rightly believes that success is fueled by talent and hard work. So with their Axe Project You campaign, they teamed up with four very inspiring men who have achieved success in their own respective fields in Food, Music, Art, and Film. 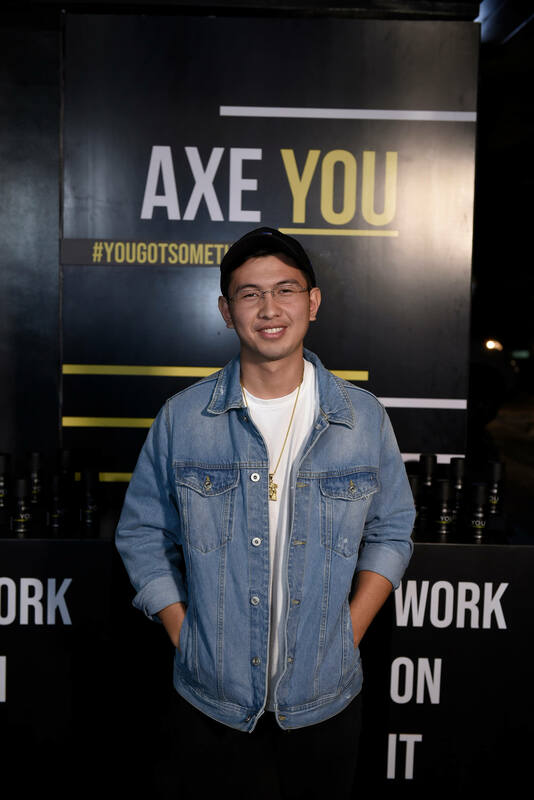 The four new Axe ambassadors who are undoubtedly men of style and substance are Chef Nicco Santos of Your Local and Hey Handsome restaurants, rapper Mito Fabie or more popularly known as Curtissmith, street artist Jappy Agoncillo, and film director Gino Santos. Axe Project You will be a 4-part Masterclass Series, with each class hosted by one of the four Axe ambassadors. In each class, each Axe ambassador will share his knowledge and skills about his respective field and participants will have the chance to take part of a challenge. The winners of these challenges will have the privilege to work with or work for their ‘chosen’ Axe ambassador. For Chef Nicco’s masterclass, he will talk about the various ways of modernizing and giving a unique twist to traditional dishes. The challenge with the participants in Chef Nicco’s class will be to innovate a traditional dish using their own techniques. The winner will have the opportunity to be Chef Nicco’s sous chef for a month and will join his team in the upcoming Madrid Fusion. 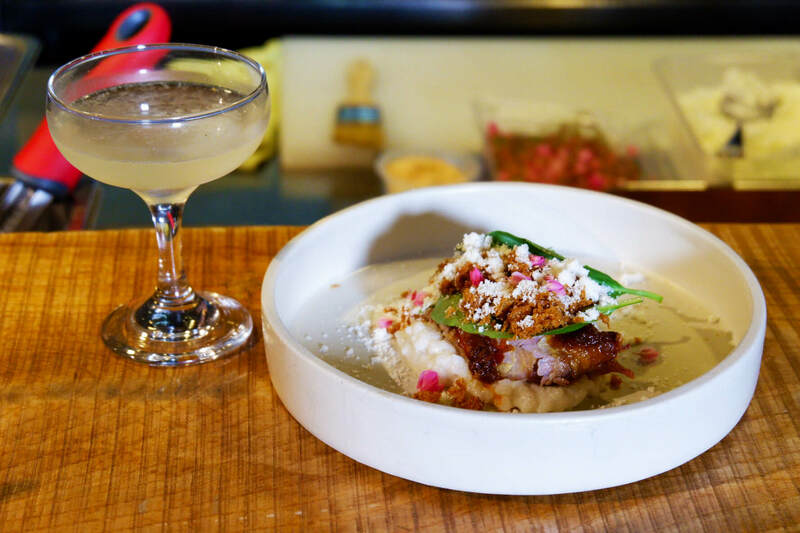 As an added bonus, the winner even has the chance to be absorbed and be put in-charged in one of his future restaurants – according to Chef Nicco himself. Chef Nicco’s masterclass will be held on March 17, 2018. 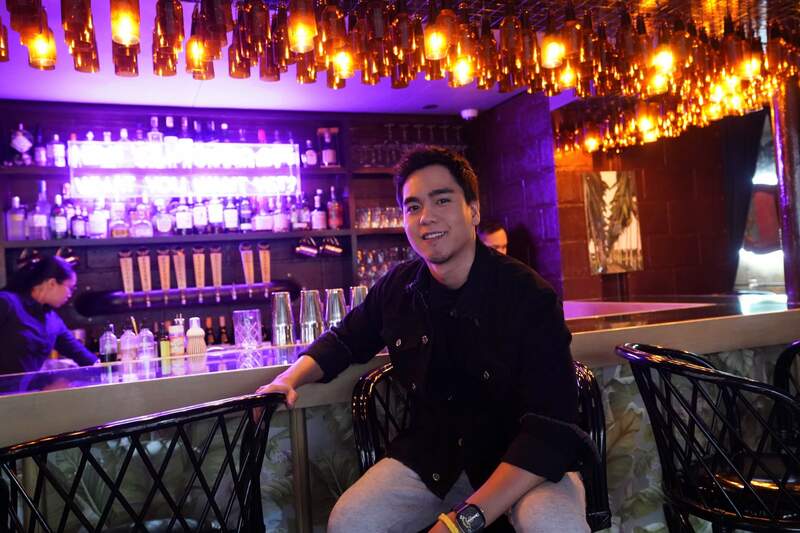 For aspiring rappers, singers, and songwriters, then you could join Curtissmith’s Word Shop. His class to be held on April 21, 2018 will talk about how to get rid of hindrances that impedes someone’s creativity. Curtissmith will talk about ways to focus on writing songs that talk about things that really matter to the writer. The challenge for the participants in his class will be to create a full song and the best one will be given the chance to co-produce with Curtissmith himself. The winner will also be able to perform live in Curtissmith’s future gigs. With Art Wars, famed street artist Jappy Agoncillo will share about the life of being a “corporate artist”. One where you need to finish an artwork on a daily basis. The challenge for his participants is to finish making an artwork with with very limited time – much like what he usually does. The winner of his challenge will have the privilege to collaborate with Jappy Agoncillo in his big future projects. Masterclass for Jappy Agoncillo is scheduled on May 26, 2018. Gino Santos, who actually was once a culinary student, started his love for films at the young age of 14. In his masterclass, Gino will discuss about the world of film-making and how being a director is not just being the end all and be all of the industry. He wants the participants of his class to discover the different types of films and the roles they could play on. The challenge for his class is for the participants to come up with their own short film synopsis. The winner will have his work co-produced by Gino and be helped enter it into a film festival. 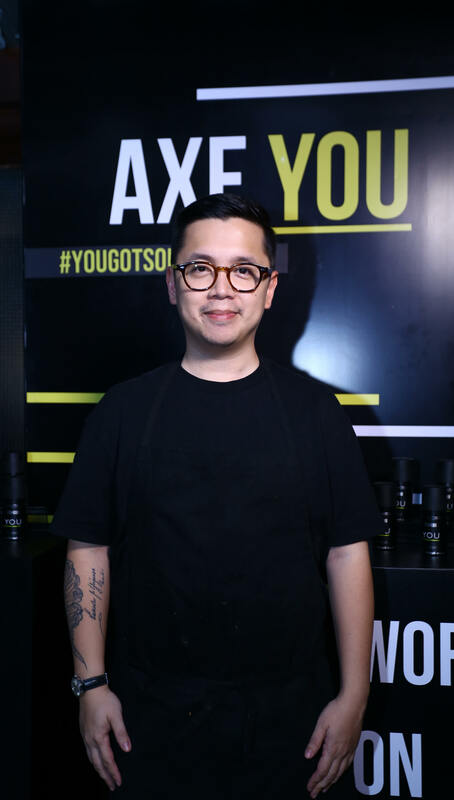 Check out this link to know more how you can join one of the four highly-anticipated masterclass for Axe Project You. Joined by two of our three blogger friends, Raina, Miguel, and Chel, we were privileged to witness this launch of Axe You firsthand. The event started off at Bucky’s located at Don Pedro St., Poblacion, Makati where we met Chef Nicco Santos. Chef Nicco treated everyone in Bucky’s a gastronomic delight as we all watched him concoct some innovative dishes and some of their bestseller drinks from Hey Handsome. One of the drinks he made mixed was Kaffir Lime which consisted of lime, thai chili, and sipsmith. It was a spicy, smoky drink and we would definitely order that on a weekend night out with friends. As mentioned, one of the fortes of Chef Nicco Santos is innovating traditional dishes. And innovate he did. We got to sample his Ayam Penyet (Fried duck, duck porridge, sambal tumis), Classic Caesar Salad and Crispy Chicken Karaage. After finishing our food, we moved on to the spot next door, The Smokeyard. From what I heard, the owner and chef of Smokeyard actually graduated as professional Pitmaster and took BBQ classes in New York and Illinois. So that thought really excited us all! We were served with their house special US Beef Ribs, Chicken Wings, Pulled Pork, and 2 of their side dishes. 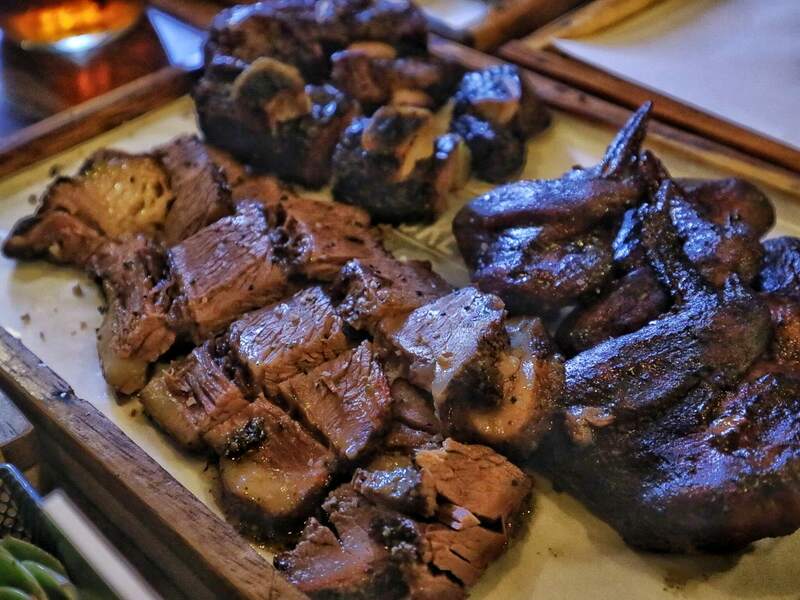 And we must say, Smokeyard is an absolute heaven for all meat lovers and grill lovers. Not only does their food taste really good and authentic but everything came at budget-friendly price points. Two aspects you rarely see come together in a restaurant that’s actually located in hip places around the Metro. As the restaurant’s name suggests, their food was mostly grilled and the smoky flavor definitely was a good match to either an ice-cold bottle of beer or their own delicious version of American sweet tea. Everything was tender and had a zesty flavor. They even have 3 special barbecue sauces to enhance that flavor! For sides, you can pick from Dirty Rice, Mac and 4 cheeses, Coleslaw, Marble Potatoes, Smoked Beans, Sweet Potato Chips, or Cornbread. 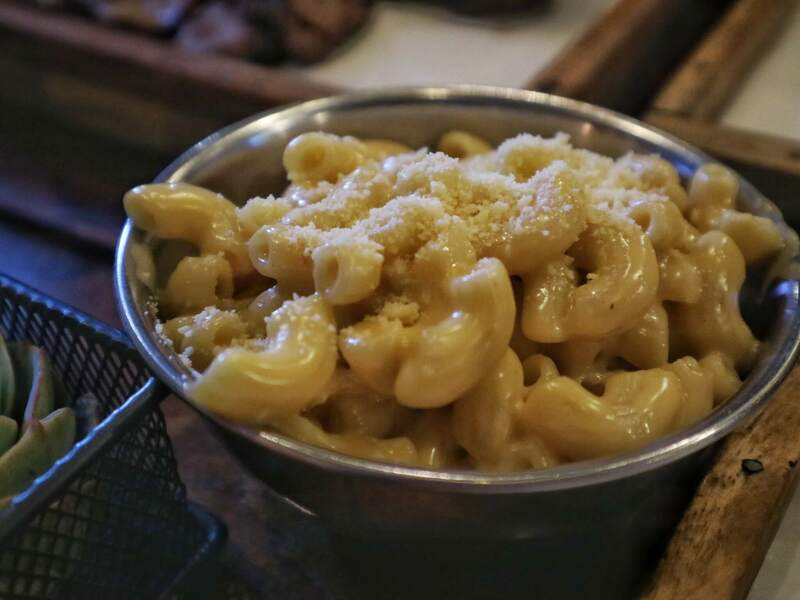 Obviously, we had to pick their Mac and 4 cheese. Because really what’s a better pair to a meaty feast than a good bowl of creamy mac and cheese? Third stop: Pura Vida. 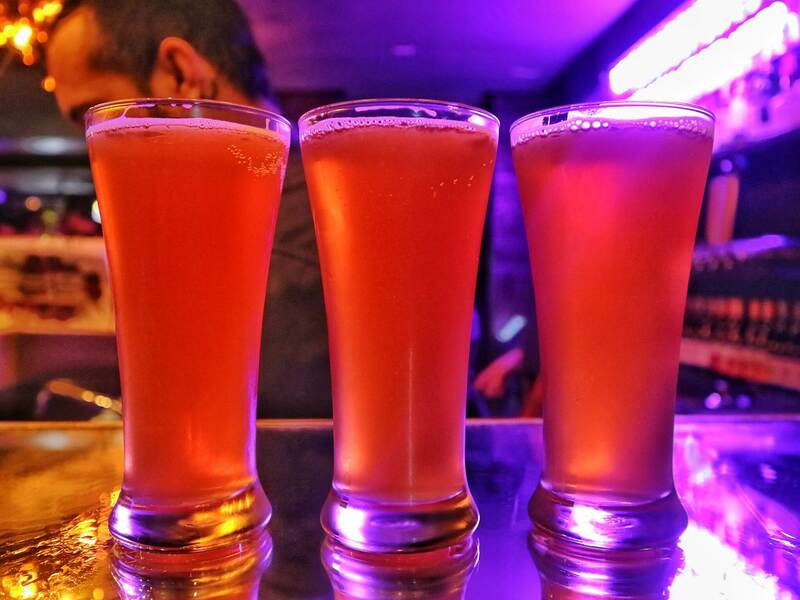 Just a few steps from Z Hostel, Pura Vida is a Costa Rican Reggae Bar in Poblacion that serves Latin American dishes and drinks. The place has a very chill vibe but was unfortunately quite crowded when we went probably because there was a band playing for the Axe You event. Everything about the place looked fun but we preferred to just move to our next stop. Our next and last stop for the night was Polilya. Thankfully, the place was less crowded and had good music when arrived and so we decided to stay. Now let us tell you this: one of the best things about Polilya, aside from their drinks and food, is the ambiance. Home to the Engkanto Brewery, the place is just plain cozy and the interiors are just superbly posh. No wonder a good deal of millennials have been flocking this place recently either for casual drinks or after-office sessions. It’s definitely one of those Instagram-worthy places you must visit. And definitely the perfect spot to cap off our Axe Project You night! We actually have a separate review of this place. So if you want to find out more about Polilya, keep tabs of our site or follow more of our food adventures in the next coming days. So cheers to pursuing our passions and embracing our individual styles! 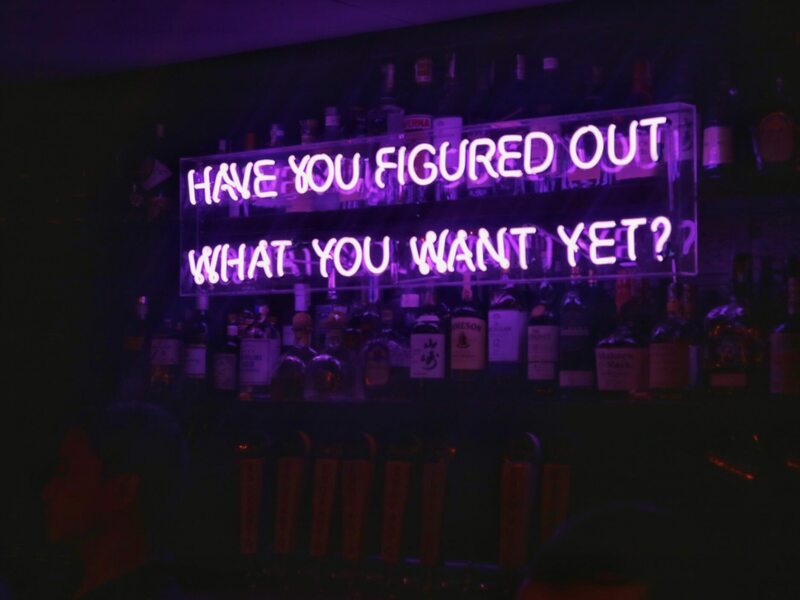 #YouGotSomething. Be bold, Be fiery, Be AXE You are (pun intended)! Hawker Chan SM North EDSA – Now Open!